I love finding the first beautiful orange-coloured apricots that appear in my garden each December for a very brief period. Apricots have been cultivated for thousands of years and are thought to have originated in Armenia, the mountainous country bordered by Turkey on the one side and Georgia on the other. The delicate flavour of apricots is intensified by cooking them, which makes them an ideal fruit for squirrelling away in bottles. I remember as a child watching my parents lugging boxes of apricots into our family home, on a farm in foothills of the Victorian Alps, near Mansfield, marking the beginning of the bottling season. 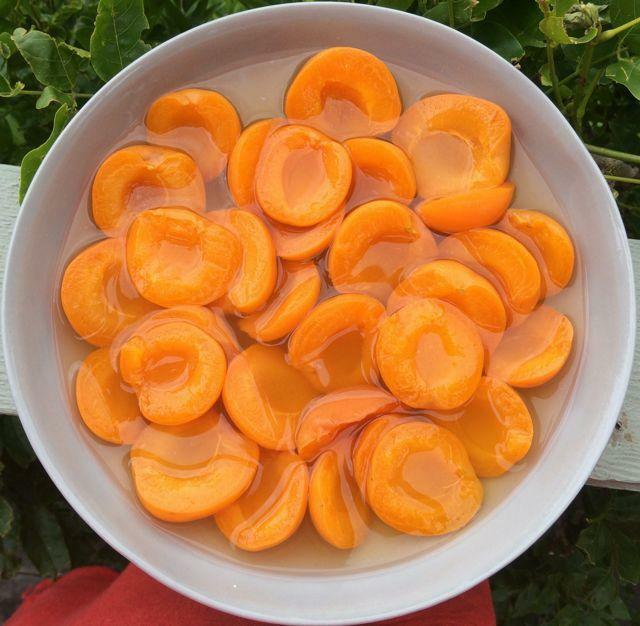 It was an exciting time as our kitchen filled with the scrumptious perfume of the stewing fruit, and my mouth was already watering at the thought of eating preserved apricots with my breakfast or after dinner with a dollop of cream or ice cream. At Griffins Hill Yoga Retreat, we continue this tradition. I add bottled apricots to millet porridge, and have made a lovely apricot and cardamon ice-cream. Some people like to add them to Middle-Eastern meat stews, and Frank has been known to make a superb apricot and almond tart. I still use my mother's Fowlers preserving kit, along with the glass bottles that are over 50 years old. It's a tradition that I would like to spread as far and wide as possible -- these skills are being left behind in the wake of our busy lives, which is why I've given away the family secret in this post. I'm sure you'll find the result is worth the effort. Before you splash out on a new set, take a peek in your parents' or grandparents' shed and see if they have a old Fowlers Vacola kit gathering dust in a neglected box. Alternatively check out second-hand shops, eBay or Gumtree I sometimes see them advertised on those sites. Otherwise, buy them online or at some hardware stores. Preserved fruit has been known to last for up to 30 years (although I bet you'll have trouble resisting eating them sooner). 1. Select 12 size-three jars and rubbers, 24 size-three clips, a Fowlers' thermometer and preserving pan. 2. Select enough fruit to fill the jars. Smaller apricots are ideal because they are easier to pack into the jars and have more flavour. The apricots must be firm, crisp and just starting to show the red tones. ‘Trevatt’ apricots are great for the purpose because they are a naturally small, firm variety. 3. Sterilise all 12 preserving bottles in one of the following ways: run them through the dishwasher, or heat them up to 130 C slowly in the oven. Set the jars aside and allow them to cool. 4. Prepare a syrup by dissolving 900 gram of sugar in 4.5 lites of water. Set the syrup aside and allow to cool. 5. To remove the apricots' stones, use a knife to cut a line three quarters of the way around the fruit then twist it to break it in half. If the apricot flesh snap apart cleanly, as shown in the photo below, then it is perfect for bottling. The apricot on the left is soft and unsuitable; the one on the right is crisp and ideal for bottling. Soft apricots can be set aside and use for jam making. 6. Pack the apricots tightly in the jars, arranging so a to leave a little space as possible between them. 7 Place rubber rings on the bottles and make sure the ring is not twisted. Then fill the bottles to the top with syrup. Put the lids on the bottles and fasten two clips to each bottle. 8. Place the jars in the preserving pan, fill with water to three-quarters full, and put on the stove on low-to-medium heat. Take one hour to bring the temperature of the water to 80 degrees Celsius, using your Fowlers thermometer to measure it. Hold at this temperature for 2.5 hours then remove bottles from pan and allow to cool overnight. By cooking slowly, the shape and texture of the apricot is maintained. The acidity of the apricots stops them from tasting too sweet, although the syrup around them is delightful. If you want to vary the flavour, add three green cardamon pods to give it spicy tang or three apricot stones to give it an almond flavour, to the bottom of the jar before you add the fruit. I have never preserved anything before (my parents did) but I am going to give it a go, as i LOVE apricots & homemade food. I will let you know how I get on using your recipe.